Kicking off holiday services in Laguna Beach next week is a sermon from guest minister Rev. Rebecca Benefiel Bijur on Dec. 23 at the Unitarian Universalist Fellowship of Laguna Beach. The Unitarian Universalist Fellowship of Laguna Beach,429 Cypress Drive, will hold a 10:30 a.m. service on Sunday, Dec. 23, at which guest minister Rev. Rebecca Benefiel Bijur will deliver her sermon “Hope in the Dark.” All are invited. Rev. 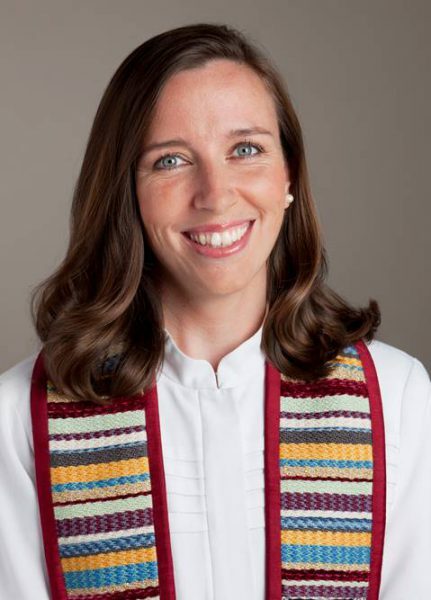 Rebecca Benefiel Bijur served as minister of the UU Community Church of Santa Monica from 2010 to 2017. She works with Clergy and Laity United for Economic Justice (CLUE) to organize, educate, and mobilize the faith community to accompany workers and their families in the struggle for good jobs, dignity, and justice. Rev. Bijur was born in Tokyo and grew up in Japan, suburban Maryland, and India. She holds degrees from Yale College and the Harvard Divinity. Laguna Presbyterian Church, 415 Forest Avenue, will have candlelight services on Dec. 24 at 2 p.m., 4p.m., 7p.m. and 9 p.m. The 2 p.m. and 4 p.m. services include a children’s story and the Bethlehem village. Nursery care for infants and toddlers will be available. The St. Catherine of Sienna Church, 1042 Temple Terrace, will hold Christmas Eve masses at 4:30 p.m., 6:30 p.m., 8:30 p.m. and 10:30 p.m. The 8:30 p.m. mass will be read in Spanish. Two services will be held on Tuesday, Dec. 25, at 8 a.m. and 10 a.m.
Christmas Eve service with the choir and gifts for the young ones will take place at 4 p.m. on Monday, Dec. 24 at St. Mary’s Episcopal Church,428 Park Avenue. On Christmas Day, the Holy Eucharist Rite II will be held at 4 p.m.
At St. Francis by the Sea Catholic Church,430 Park Avenue, there will be a Christmas Eve mass at 5 p.m. and Christmas Day masses at 9:30 a.m. and 11: 15 a.m. Neighborhood Church, 340 St. Ann’s Drive, will have a Christmas Eve candlelight service at 7 p.m. with music by Beth and Steve Wood, Pam Wicks, Doug Miller and Karen McBride, the church choir and the hand bell choir. Church by the Sea, 468 Legion Street, will have Christmas Eve services at 4:30 p.m. and 6 p.m. Childcare will be available for kids ages 4 and under. The Laguna Beach United Methodist Church, 21632 Wesley Drive, will hold two services on Christmas Eve. Lessons and Carols at 7:30 p.m. and Communion and Candlelight at 11 p.m.